Click on CPF Public Housing Scheme – What is it all about? The CPF Public Housing Scheme (PHS) enables CPF members to use their CPF Ordinary Account (CPF OA) savings to buy new or resale Housing and Development Board (HDB) flats.​ Under the CPF Public Housing Scheme you can use your CPF OA savings to buy an HDB flat – both new Built-To-Order flats as well as resale flats. The CPF Public Housing Scheme allows members to use their CPF OA to finance all or part of the purchase price, service monthly housing loan installments taken to buy the HDB flat, and pay the stamp duty, legal fees and other related cost such as flat upgrading cost. 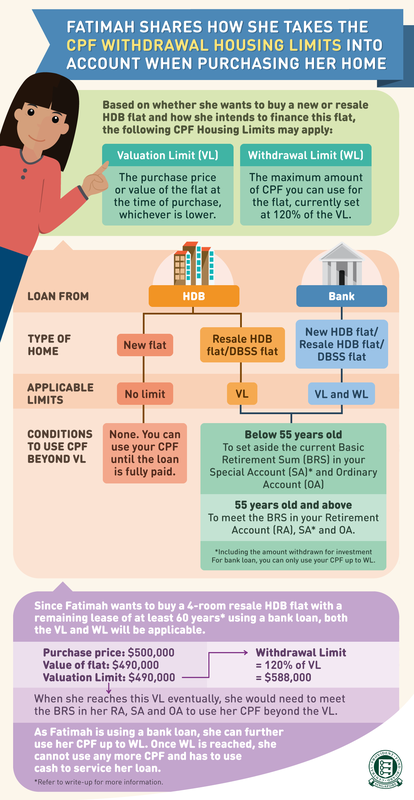 buying an HDB flat with a remaining lease of less than 60 but at least 30 years and their age plus the remaining lease of the HDB flat is less than 80 years. The CPF Board has placed housing limits on the amount of CPF savings members can use. It depends on whether it is a new or resale HDB flat; and whether you are financing your HDB flat via an HDB concessionary loan or bank loan. The amount of CPF members can use is lower if they are buying an HDB flat with a remaining lease of less than 60 years but at least 30 years. One can also use their CPF to buy their second or subsequent property with a remaining lease of at least 60 years after meeting certain conditions based on their age. If one is below 55 years of age, they need to set aside the current Basic Retirement Sum in their Special Account, including the amount used for investments, and Ordinary Account before they can continue to use their CPF savings. If one is 55 years old or older, they need to set aside their Basic Retirement Sum in their Retirement Account, Special Account (including the amount used for investments) and Ordinary Account before they can continue to use their CPF savings. Although using the CPF to buy two or more residential properties is an option, one should consider if they want to use the CPF savings to finance the private property instead of using cash. One should be mindful not use all their CPF OA savings to finance their property, because CPF is essentially for ones retirement. The post CPF Public Housing Scheme – What is it all about? appeared first on iCompareLoan Resources.